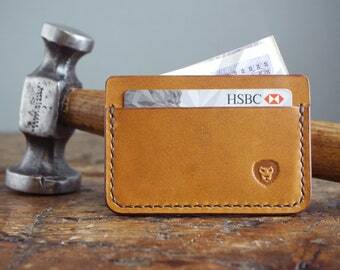 Handcrafted leather wallets, belts and accessories. 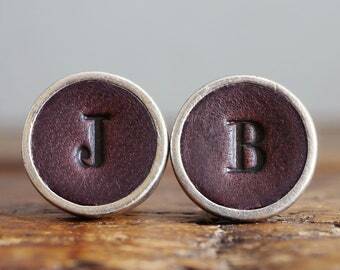 Beautifully made cuff links. Leather and silver were exactly as described, and came to me in a cracking little presentation box and a cotton bag. Ready for gifting and much appreciated - thank you! On time, cufflinks are lovely, just as described. 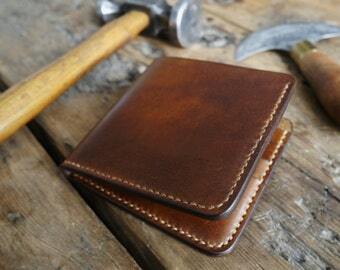 Work in progress... stitching up a leather cardholder. Hello! 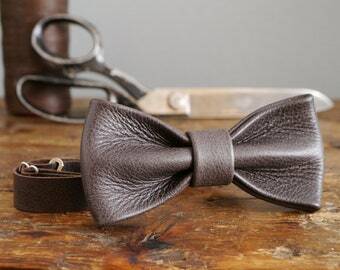 I am Kingsley, the craftsman behind Kingsley Leather. Like so many others I had an office-bound day job and I also dabble in graphic design and, as you can imagine, I spend a lot of my time in front of a computer screen. I wanted a 'manly' craft that would take me away from a computer but also creatively challenge me. What inspired me to take up leatherworking in particular was that I have always admired leather goods and how they gain character as they age, think old leather suitcases and satchels etc. However the cheap mass-produced imports never seemed to last as long as I expected - I was changing my wallet every 6 months for example! I decided that I could kill 2 birds with 1 stone: create the quality leather goods that I desired for myself and pursue a new non-computer based hobby. After a couple of months of practicing, my work began to get noticed by friends and family and this led to my first set of 'commissions'. After creating a leather satchel for my girlfriend, a wallet for my brother, and plenty of belts, I soon decided to begin accepting orders from the wider (and paying!) public. I now run Kingsley Leather full-time and have never looked back - follow me as my journey continues. To fulfil your order, you must provide me with certain information (which you authorise Etsy to provide to me), such as your name, email address, postal address, payment information, and the details of the product that you’re ordering. You may also choose to provide me with additional personal information (for a personalised order, for example), if you contact me directly. For purposes of EU data protection law, I, Kingsley Thompson, am the data controller of your personal information. If you have any questions or concerns, you may contact me at hello@kingsleyleather.